Immerse yourself into the fun and magical universe of Hasbro's Littlest Pet Shop with this ultra-large XL mural from RoomMates. It's 6ft high x 10.5 ft wide! Perfect for any child's bedroom wall. Printed in high-resolution, this wall decor transports you into the most friendly and brightly colored world of the popular collectible toy line. 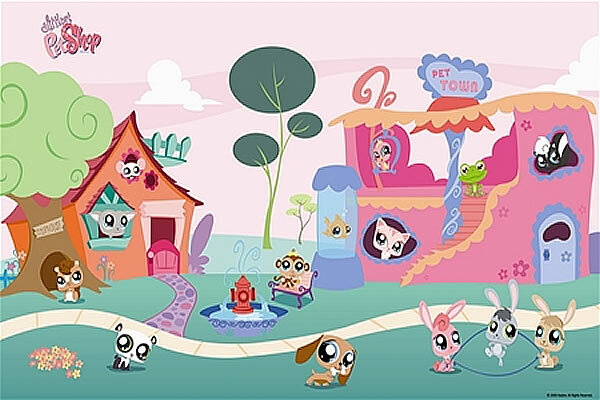 All your cutest, cuddliest Littlest Pet Shop characters are there and their world takes a new dimension with these sequentially numbered pre-pasted panels that turn this XL Mural into the easiest and fastest extreme room make over you'll ever undertake. Just dip each strip in water and apply to the wall. Printed on a revolutionary and proprietary SurestripTM material, this mural removes in minutes with no tools (simply pick a corner and pull - each panel comes off in full strip).